Distal arterial embolization to the foot with PMMA during vertebral augmentation has not been previously reported. We report a rare case of distal PMMA embolization to the dorsal foot artery during ipsilateral percutaneous lumbar vertebral augmentation in a patient with spinal osteolytic metastases. A 68-year-old woman was admitted because of severe disabling low back pain. 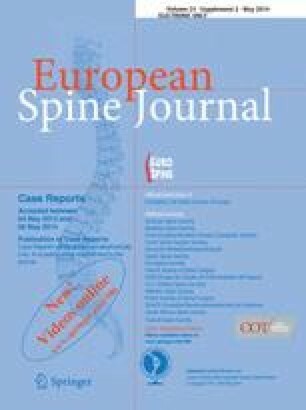 Plain roentgenograms, MRI and CT-scan revealed osteolysis in the L4 and L5 vertebral bodies with prevertebral soft tissue involvement. Percutaneous vertebroplasty with PMMA was performed in L2 to L5 vertebrae under general anesthesia. Intraoperatively, leakage into the segmental vessels L3 and L5 was observed. Four hours after the procedure the clinical diagnosis of acute ischemia and drop foot on the left was made. CT-angiography justified linear cement leakage in the course of the left third lumbar vein and fifth lumbar artery, and to the ipsilateral common iliac artery. The patient was treated with low molecular heparin and the ischemia resolved without further sequelae 1 week postoperatively. PMMA leakage is a complication associated with vertebroplasty and kyphoplasty. Although the outcome of the PMMA embolization to the vessels resolved without sequelae, in our case spine surgeons and interventional radiologists should be aware on this rare complication in patients with osteolytic vertebral metastases even when contemporary cement containment techniques are used. An erratum to this article can be found at http://dx.doi.org/10.1007/s00586-013-2938-7.